In your autobiography the Goldfish Bowl you made much of the tensions with your father, who was the renowned architect Sir Edwin Lutyens, and you summed up the struggle to find your own vocation in the words: “Too bad if I had no talent – I would simply have to acquire one.” And to illustrate the myth you posed for wonderfully atmospheric photos like the ones below. The problem was that when I re-read my article I realised that your sound-bytes about English pastoralists writing folky-wolky modal melodies on the cor anglais’ and ‘if I hear another cadence I will scream’ were all just a little too predictable. So I scrapped my piece, and spent a few months following An Overgrown Path to try and find the real Elisabeth Lutyens. What I found was a picture rather different to the one you so often painted of yourself, and one which is far more interesting and rewarding. For instance many biographies perpetuate the myth that your Rimbaud setting ‘O Saisons! O Chateaux!’ was rejected by the BBC as “unsingable”. Yes, they did reject the piece, but for the practical reason that in 1947 few soloists had the required range from top B flat to low G. Your claim of neglect by the BBC, and discrimination as a woman, is also difficult to accept. William Glock was the BBC’s Controller of Music from 1959 to 1972, and he rectified the paucity of serial music with a policy of ‘creative unbalance’ which gave the music of Schoenberg and others, including you, ‘unnatural prominence’. The far-sighted Glock also pioneered the large scale commissioning of new music by the BBC, with a remarkable 124 commissions during his tenure as Controller of Music. You received eight of these commissions, which was more than double that for any other composer, male or female, and compares with five for Harrison Birtwistle and Peter Maxwell Davies. And your support from the BBC didn’t just start with the appointment of the visionary William Glock in 1972. Your first Proms performance came in 1940, and in 1947 Humphrey Searle arranged for the BBC to give a complete concert of your music. There was also important support for you elsewhere, including a very high profile, and successful, commission in 1966 for the opening of London’s Queen Elizabeth Hall. The BBC also did you proud, to celebrate your 70th birthday in 1976 they gave no less than six concerts of your music, yet you still felt your music was neglected. For a maverick with a professed allergy to cadences and ‘cow pat’ music it was interesting to discover that some of your output from the early 1940s was ‘almost exclusively tonal and deliberately accessible, even overtly patriotic’ – presumably complete with ’folky-wolky modal melodies on the cor anglais’? I appreciate that in 1971 you total income from BBC broadcasts came to less than the royalty from a single showing of Dr Terror’s House of Horrors in Spain, which was one of the many Hammer horror films you scored, and this explains why you needed the income from writing advertising jingles for Be-Ro flour and Imperial Leather soap. But although your membership of the Communist Party is well documented your film music for the United Kingdom Atomic Energy Authority (including a score for a documentary on the UK’s first atomic bomb tests) and NATO aren’t so well known. Perhaps because it didn't sit very comfortably with your public disapproval of the Labour government's support for American policy in Vietnam? Or was it add odds with your support for the Palestine Liberation Organisation, and your deplorable anti-semitism? For someone who was shunned by the musical establishment you were pretty well connected. 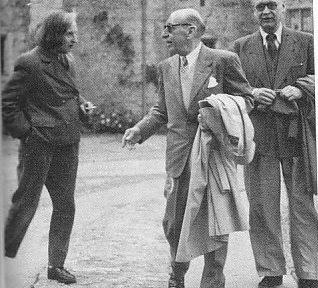 You first met Pierre Boulez in 1946, Hanns Eisler was a friend, and, as my header photos shows, so was Stravinsky. You played in a new music group alongside Benjamin Britten in the 1930s, Richard Rodney Bennett was a pupil, and your circle included most of the leading British contemporary composers of the 1950s. When you visited New York in 1969 the gusts at your welcoming party included Truman Capote, Anita Loos, Norman Mailer, Edward Albee, Isaac Stern and Leonard Bernstein. Quite understandably you developed a distaste for religion as a reaction to your mother’s advocacy of Theosophy, and you hated the trips to India as a disciple of Krishnamurti. But you wrote wonderful settings of the Magnificat and Nunc Dimittis for the choir of Coventry Cathedral, although it seems they were never sung there due to their extreme difficulty. You had no time for organised feminism, but in 1979, five minutes before appearing live on BBC Radio 4's 'Start the Week' you threatened to denounce Russell Harty as a 'homosexual interviewer' if he mentioned the phrase 'lady composer'; thankfully he avoided the words when the programme was on air. The problem Lizzie is that I didn’t find much substance to the legend of Elisabeth Lutyens as the maverick composer who was neglected in her own lifetime. But what I found was far more remarkable. I found a unique musical voice that was in the vanguard of contemporary 20th century music, and a composer who achieved deserved recognition for an output that was both innovative and accessible. Above all your music makes the myth irrelevant. 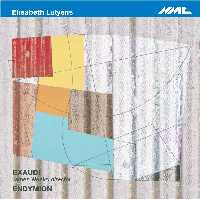 One of my revelations was the new NMC recording by the contemporary music groups Exaudi and Endymion directed by James Weeks. This beautiful CD presents a sequence of your chamber and choral works in a palindromic structure, a presentation I am sure you would approve of. The riches on the CD are too many to describe here, but include the Magnificat and Nunc Dimittis mentioned above. But the real masterpiece is the Motet (Excerpta Tractati Logico-Philosphici) which is often known as your Wittgenstein Motet. The myth would present you as the composer of obscure music setting an arcane philosophical text. Rubbish! You set Wittgenstein because the text fitted your musical model. The piece may be fiendishly difficult for the voices to pitch, but the motet is certainly not fiendishly difficult for the listener to appreciate, despite its use of serial techniques. And you have a very powerful advocate in the form of contemporary composer Bayan Northcott who co-produced the NMC CD, and wrote the wonderfully illuminating notes. Stravinsky features in my header photo with you, and he once wrote: ‘One could not better define the sensation music produces, than by saying it is identical with that evoked by the interplay of architectural forms.’ You made much of the tension between you and your father, but in fact his approach to architectural form compliments your music perfectly. 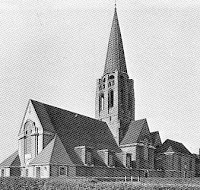 James Weeks’ new CD, which should be in the collection of every student of contemporary music, was recorded in the wonderful acoustics of St Jude's-on-the-Hill, Hampstead, London (above), a church designed by your father and often used for recording sessions and concerts. Lizzie, I can forgive you the myth of the Horror Queen as you certainly didn’t have an easy life. The myth is irrelevant, the music is what matters and that cries out to be heard – including your unperformed opera The Numbered, which is scored for eighteen soloists, chorus, three actors, and symphony orchestra including huge percussion section, two mandolins and two electric guitars. But it is tragic that the myth of neglect and abrasiveness you created has become self-fulfilling since your death in 1983, and your centenary year passed with scarcely a performance of your music by the BBC, or elsewhere. This is quite scandalous, your music deserves to reach a much wider audience, and I hope that the revelatory recording by James Weeks and Bayan Northcott, the brilliant 1989 biography by Meirion and Susie Harries, and this little letter will prompt a long overdue reappraisal. * The music of Elisabeth Lutyens performed by Exaudi and Endymion directed by James Weeks is on NMC D124, audio samples and MP3 purchase available via this link. * I cannot recommend the biography of Elisabeth Lutyens, A Pilgrim Soul highly enough. It is a model biography, meticulously researched, eminently readable, and brilliant at positioning Lutyens in a broader cultural context. The authors are Meirion and Susie Harries, publisher Michael Joseph, ISBN 0718125479. Now for the rub, it is out of print. But fortunately copies are still easy to find online. * Listen to Elisabeth Lutyens talking about Schoenberg, Webern, serialism and more via this link. Now, for more on architecture and contemporary music take An Overgrown Path to Iannis Xenakis composes in glass. Wow, that's quite an essay, the back-handed compliment taken to a mythic level. You make me want to hear her music AND read the biography of the woman. Anybody who spans Wittgenstein and Hammer Films is definitely of interest. Thanks for an interesting entry, Pliable. I have a CD made from an LP of Luyten's Quincunx (coupled with Maw's Scenes and Arias), I'll have to dig it out and give it a spin and forget that she seemed to have been quite a ghastly woman to deal with. It doesn't seem likely, due to being unperformed and all that, but I'd love to hear her opera at some point. What a phenomenal post. I've been peripherally interested in Elizabeth Luytens ever since I saw a score of hers at the Dylan Thomas Centre in Swansea. I love your style of presentation. Argh, make that Lutyens, my apologies. Thanks for this article, Pliable, although I would like to point out that "Elisabeth" is spelled with an "s" and not a "z". I agree with you on many points, particularly about the opera "The Numbered," which incidentally was the subject of my Ph.D. dissertation in 2003 (available through UMI) and my article in the journal "Theory and Practice" in 2005. After five years of research on this work, and several more writing a book on her music (in progress), I remain convinced of its brilliance and stageworthiness (more so than her other operas). To Henry Holland: I'd love a copy of your Quincunx CD -- if you read this, please e-mail me at parsons@post.queensu.ca. I don't think it's quite correct to refer to her as "ghastly to deal with." There's no question she could be extremely difficult at times, but most of the people I've interviewed have also stressed her unparalleled generosity and warmth, especially to young people. That's what comes of writing about EliSabeth Lutyens and EliZabeth Maconchy at the same time! Aha, so that's it! Glad to hear you're also writing about Elizabeth Maconchy -- another great composer! Thank you for a very interesting article. I have admired Lutyens since the 1970's when I read her autobiography "A Goldfish Bowl" and, as you point out, there were several broadcasts at the time. Her Requiescat in Memorian Igor Stravinsky is deeply moving. I also have happy memories of the mentioned LP with Quincunx coupled with Maw's Scenes and Arias. Scenes and Arias is now on CD and Qunicunx will appear sometime as Lyrita works through its back catalogue. The BBC did feature Lutyens as its composer of the week to commemorate her centenary. They recorded some of her works for broadcast and it seems a pity that they won't sell these as downloadable mp3s (imagine the entire BBC archive for sale). Lastly why criticise Wikipedia? Why not edit it? Lutyens is one of my favourite composers. When much younger I copied out her 6th String Quartet in Manchester. I couldn't write it down fast enough. It is that quartet that is the ghost behind my first real mature effort in the medium. O saisons, o chateaux was mentioned. It is one of the most beautiful of all 20th century vocal works. At the 100th year of the Proms the late John Drummond presented a Glock orientated programme, which included her ravishing "The Tears of Night". I only heard it once before on the radio, and made a very poor recording of it on cassette (now sadly I cannot find that recording). If you ever get the chance to hear that work, drop everything! You will not regret it! Lutyens was badly represented in hear 100th year. Nothing at the Proms. Maconchy fared little better, but she at least was represented with a few works at the Three Choirs Festival in Gloucester (and they were lovely!). Does anybody have any radio recordings? I have a few somewhere and I really should get them on to my iTunes. I know one of the performances includes Philips Langridge as the tenor soloist. What a service he did to new music in his younger years! Cliff, yes what about the BBC archive? Surely they must have loads of recordings squirrelled away somewhere. Are there any other Lutyens lovers who would love to rummage through the archives? I would love to!!! What a read! Love it. Some interesting comments too. I have nothing more intelligent to contribute!! Very thoughtful and interesting! At first the 'gotcha' style is a little off-putting but on a second read the thoroughness is refreshing. I'm off to check out the biography! Wonderful article on Elisabeth Lutyens. One minor correction (only because I'm a horror film fanatic), "Dr. Terror's House of Horrors" was produced by Amicus Films, not Hammer. Although, since both companies employed Lutyens as well as producing films that featured similar casts, it's easy for them to be confused.